Feature-wise, we hammered at Yonkers on Friday with the Matchmaker and were shut out of the “Levy” on Saturday—but not by Foiled Again. His off-the-board loss on April 19 was a big story in the industry but not for bettors. The story for bettors was that Foiled Again lost and lost badly but the winner was a five-cents-to-the-dollar entry. That is insult to injury, considering how difficult it has seemed to beat the stalwart pacer. Our victory was predicted perfectly in round two of the Matchmaker, as Monkey On My Wheel won in the short field, paying $29.40 and $8.90 (no show betting). In the first division, the other Casie Coleman-trained mare, Scandalous Hanover, who was our choice, lost at 2-1, suffering a bad outside trip on the half-mile. Our three Levy choices were not entirely skunked by favorites. PH Supercam surprised at 9-1 in division one (Sapphire City was fourth, Apprentice Hanover was third—no show wagering); Dancin Yankee won the next split at close to 2-1 (Texican N was third—no show wagering) and in the Foiled Again loss to Easy Again, Malak Uswaad (74-1) was fifth. In our Pick-3 and-4 choices at the Meadowlands Friday we had only one second with Wheels ($3.80, $3). Saturday, our pick in the Pocono feature, All Gold (18-1), finished fifth, while our Meadowlands feature picks were fourth (Hobe Sound, 25-1) and eighth (Burkentine Hanover, 70-1). TwinSpires and the Hoosier 10-percent Pick-4 Bonus continued and on Apirl 16 we offered a few additions to tickets. Two of the five we suggested were scratched and the others were off the board. Two Hoosier winners on the horses-to-watch (H2W) list below, however, were involved in bonus exotics. Every time you cash a winning Pick 4 ticket at Hoosier Park, you receive a bonus equal to 10 percent of the gross winnings, up to $500 per night. We will assist on Twitter occasionally, with suggestions for your tickets. 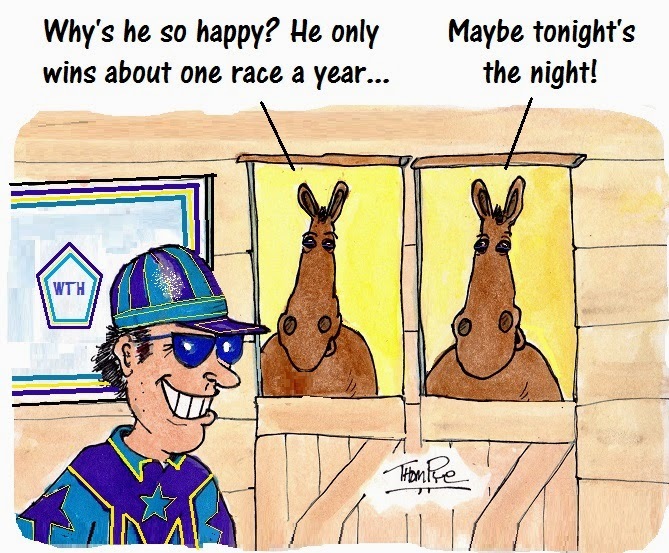 Follow @FrankCotolo and @TwinSpires for choices. More well-known horses were prepping at the Meadowlands in qualifiers over the past weekend, with the star of the show Arch Madness returning from a long hiatus. The veteran trotter from the Trond Smedshammer barn, raced against some other familiar, though younger trotters, Corky and Archangel. Arch Madness left them in the dust, winning by several lengths in 1:53.3. “The buzz among the observers was that he looks as good or better than he has in the past few seasons,” said our source at the morning trials. Conditioners Tony Alagna, Jimmy Takter and Linda Toscano were present and Linda had her stable star Market Share on the track for a successful workout sans minus trotting hobbles to freshen for a trip to Sweden to race in the Elitlopp. Takter’s 2013 Breeders Crown frosh-filly pace winner Uffizi Hanover made her first appearance with a 1:54.4 tune up. Takter’s lightly raced Gettingreadytoroll won in 1:53.3. Late to the races at two, Gettingreadytoroll has a single money start, a win in 1:54.2 at Pocono. All Bets Off “looked sharp” in his second prep for the Ron Burke stable. The Matron winner in 1:52.4. Burke’s Governor’s Cup winner JK Endofanera won his qualifier in 1:52.4 over Ideal Cowboy and Somewhere Fancy in another key prep for this group. Odds On Equuleus returned to the races after a disappointing sophomore campaign. See And Ski and OK Commander finished across the track together in 1:52. It will be six months before we see driver Andy Miller back in the sulky after a frightening accident at Yonkers last week. Miller, driving Marmara Denizi, trained by his brother, Erv, was in the back of the field when unseated during the first race. Also unseated was George Brennan, driving In The Clear, who appeared to step on the wheel of a first-up Fiftyshadesofhay. In The Clear went down. Brennan got up and resumed his drives for the card. According to Miller’s wife, Julie, as well as trainer Scott DiDomenico, Miller broke a pair of lumbar vertebrae in his back. He had surgery and will miss chances to participate in some of the sport’s biggest events of 2014. In less than three weeks, Bee A Magician, 2013 Horse of the Year, will be back to races at four. Trainer Richard Norman confirmed that the Kadabra daughter will be qualifying the first week of May. “There are no health problems,” said Norman, “and I’m very pleased with her … It’s amazing but she finished up last year as good as she started. She hit her knee in the first start back but other than that she weathered the storm pretty well.” The plan is to launch her season in the Miss Versatility at Mohawk and then roll right into the Armbro Flight. Last season Bee A Magician won all 17 starts against the same foes in her division. She was discovered on this blog at two. The winner of $2.2 million lifetime did not get our vote for the best of ’13; we went with Captaintreacherous.